The latest Census estimate shows significant gains in single-family and multifamily private residential construction spending from one year ago. 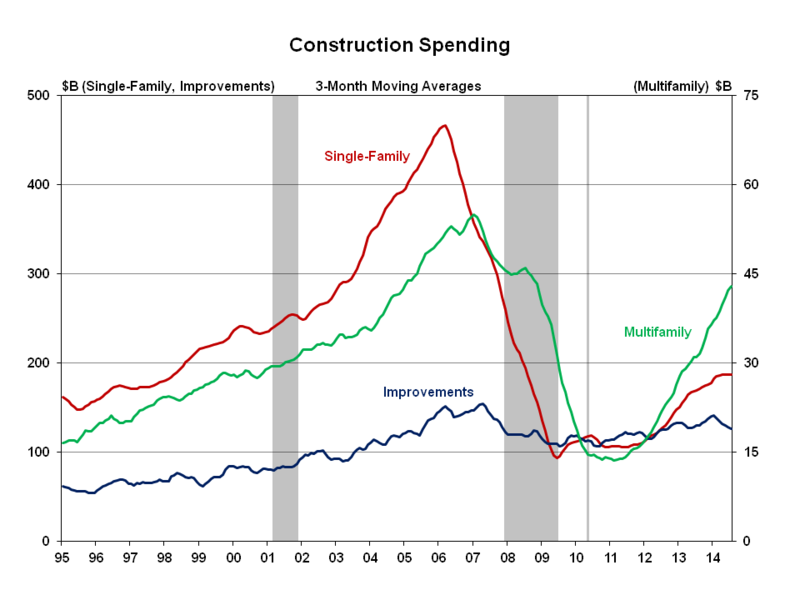 On a 3-month moving average basis from July 2013, single-family construction spending increased 9.9% and multifamily construction spending increased 38.4%. The current seasonally adjusted annual rate for total private residential construction spending (single-family, multifamily, and home improvements) is $358.1 billion. Although the home improvement component of residential construction spending is down 2.2% from one year ago, the current reading is 1.2% higher than the revised June estimate. In fact, all three categories of residential construction spending increased from the prior month. Single-family spending increased 0.5% and multifamily spending increased 0.2% month-over-month. The increase in construction spending matches the improvement in builder sentiment. The August NAHB/ Wells Fargo Housing Index rose another two points in to 55. An index reading above 50 indicates more builders see the market improving than see it getting worse.